Myra Greene writes, “throughout my artistic practice, I have returned to the body to explore issues of difference, beauty, physical and emotional recollections as they play out on the surface of the skin.” In her two recent series, Character Recognition and My White Friends, Greene uses portraiture to investigate the construction of racial identity and focus on the ways her own body relates to others. 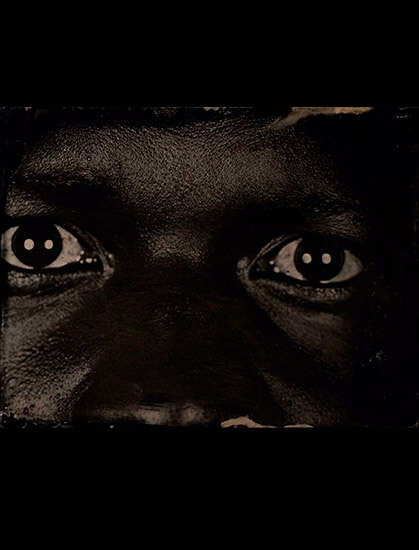 In Character Recognition, Greene adopts the wet-plate collodion process, a 19th-century photographic method that was implicated in the history of colonialism and slavery and used as tool for ethnographic classification. 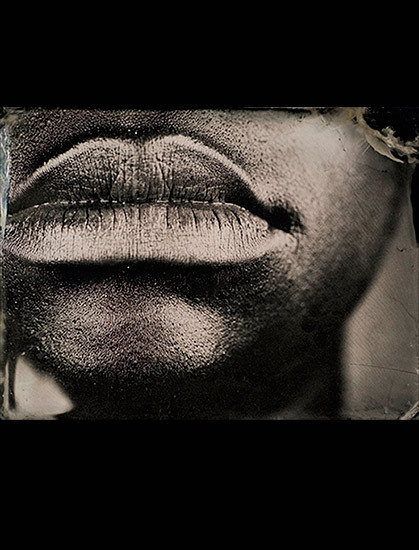 If ethnographic photography was at times aimed at creating a typological record of racial physiognomy, Greene amplifies and examines these preoccupations by photographing her own nose, lips, ears, and skin—which she describes as “the features of race”—as if dismembered from the rest of her body. Although Greene is working with a highly-coded historical process, one that evokes a complicated and disconcerting past, her photographic studies reorient it in a number ways. She uses a black glass plate, instead of the conventional transparent glass, which results in a unique positive image instead of a negative that could be used to make endless reproductions. Moreover, in making self-portraits, she willingly stands before the camera and controls the process. Her photographs capture not only parts of the body but their small expressive gestures. 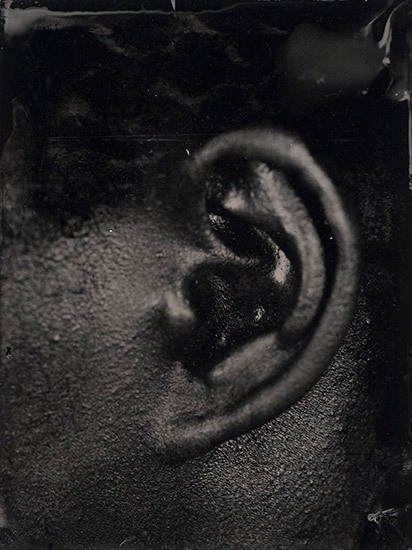 Effectively allowing the body to “speak back” in this manner, Greene reacts to and rejects the previous modes and manners of classification, displacing the collodion photograph’s earlier role as an exploitative, quasi-scientific record; in its place she offers a rich sensory experience that hints at the individual and the personal. Greene questioned her own race in the Character Recognition project by asking, “What do people see when they look at me? Am I nothing but black? Is that skin tone enough to describe my nature and expectation in life?” With her series My White Friends, Greene moves away from her own African-American identity and physical characteristics to ask similar questions of “the other,” in this case the Caucasian racial majority in America. The artist consulted with her white friends about the individual characteristics that make them feel qualifiedly “white” and then staged photographs that portray each sitter’s description. 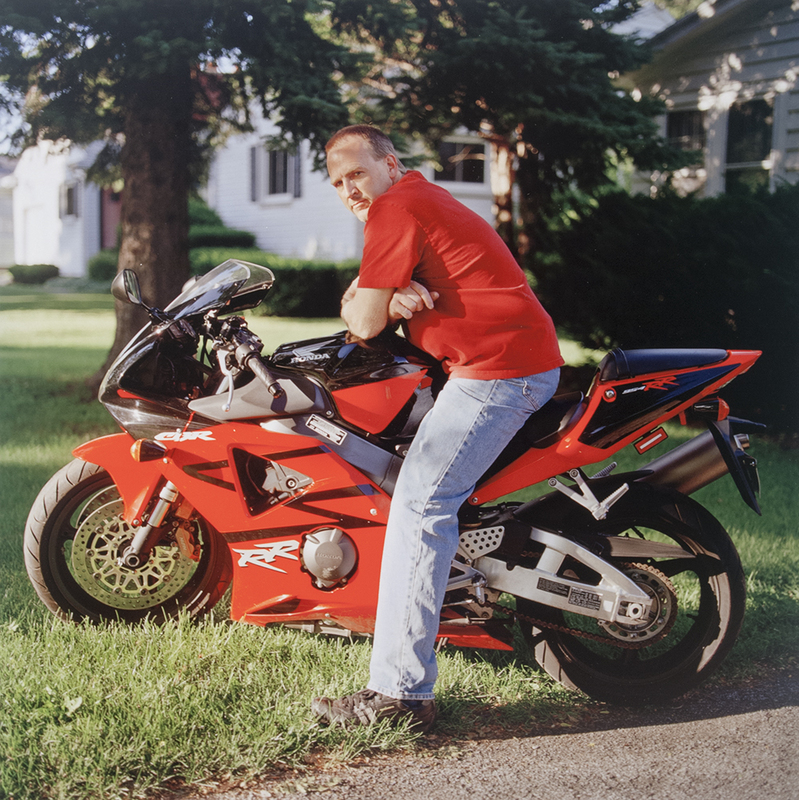 The end result is a series of seemingly banal color photographs that reenact the descriptions of racial identity told by these individuals for the camera, such as a man holding a glass of red wine, wearing flip-flops, and sitting on a front porch in front of a house with perfect white siding. Greene hopes by creating these photographs and investigating the lives of her subjects that she can better understand the inherent racial stereotypes surrounding her friendships. 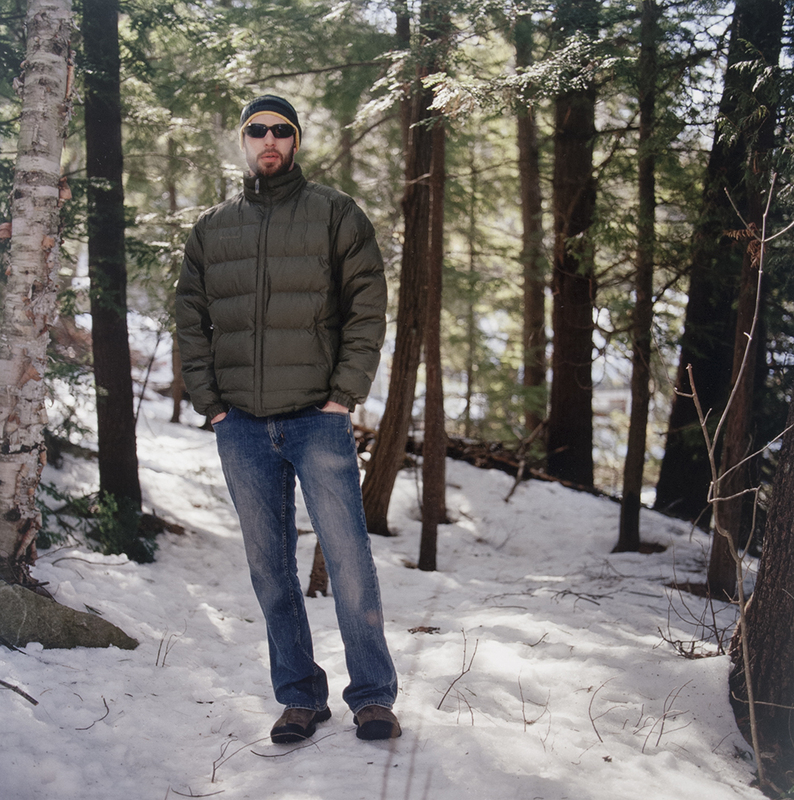 Greene holds an MFA in Photography from the University of New Mexico (2002) and a BFA from Washington University, St. Louis (1997). Solo exhibitions of her work have recently been held at Harold Lemmerman Gallery, Jersey City, and Maryland Art Place, Baltimore, and her photographs have been included in numerous group shows at venues such as the Art Institute of Colorado, Denver; Wadsworth Atheneum Museum of Art, Hartford, Connecticut; Center of Photography, Woodstock, New York; and Visual Studies Workshop, Rochester, New York. 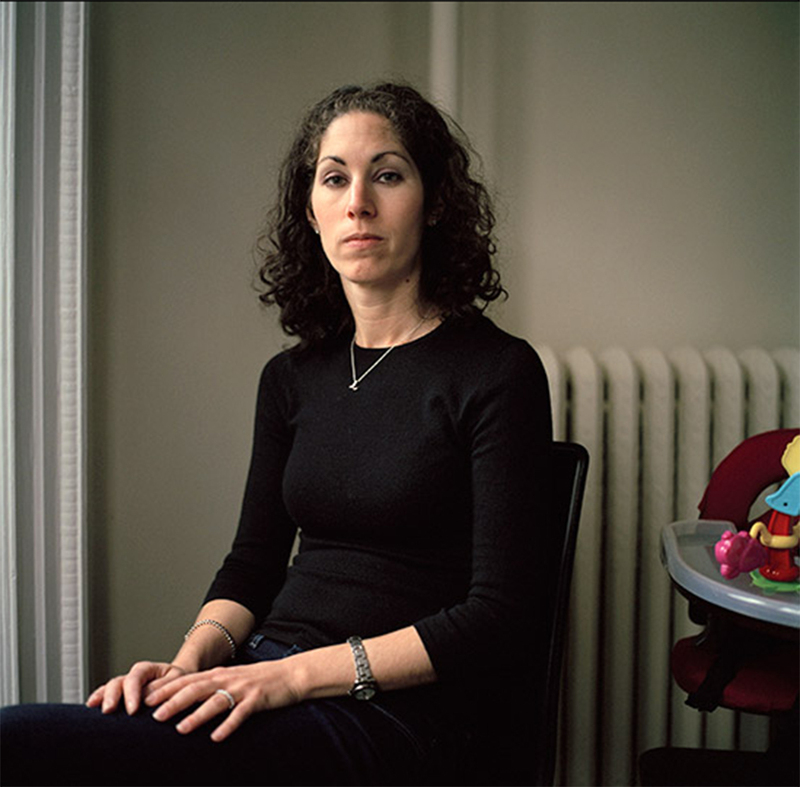 Greene is a faculty member in the Department of Photography at Columbia College Chicago.